Turkey is a specialty food in Viet Nam. They call it ga Tay ~ Western chicken. Or, more specifically, ga Tay My ~ American Western chicken…..and it’s not cheap! 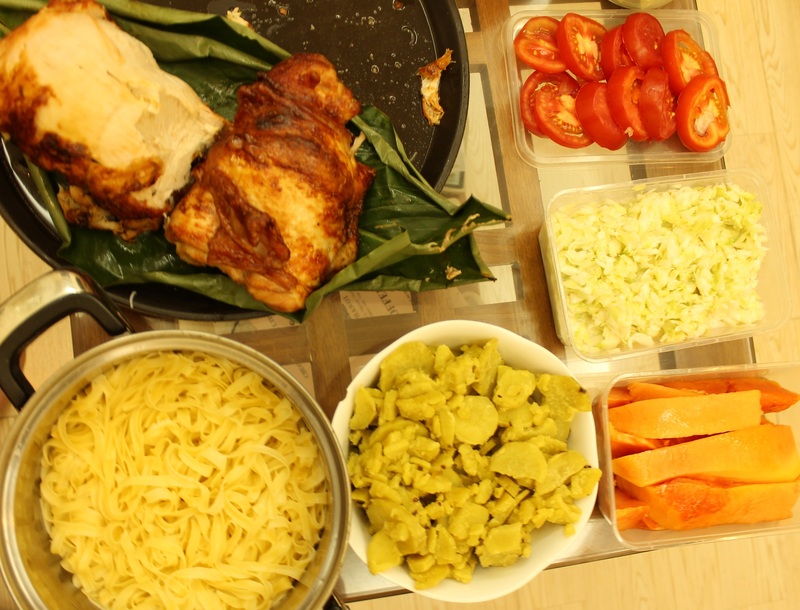 But, honestly, most all other foods here are cheap, so spending a little more for a taste of home cooking on this special day was worth it……if only we could figure out where to buy it…..and where/how to cook it. Oven? ….what’s an oven…? Mike was told by someone at his work where to buy it. 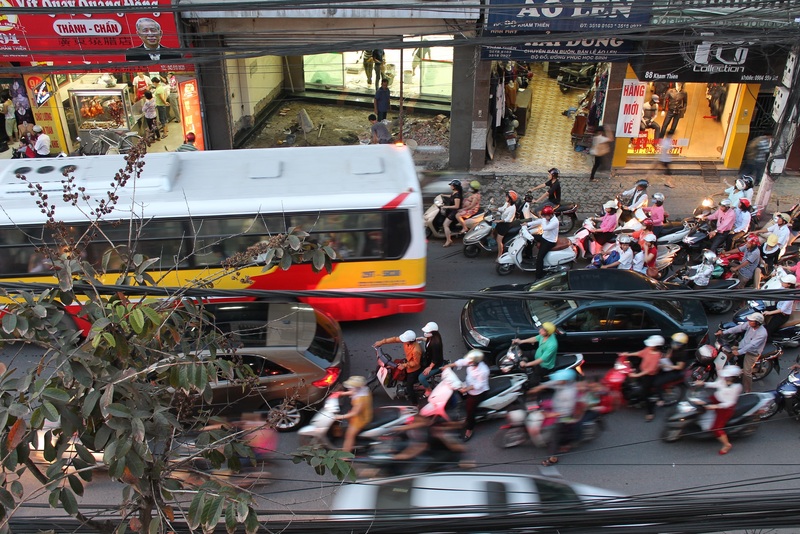 He just had to find the place…..when it was open…..which is not as easy as it may sound here in Ha Noi. I know ~ I went with him to look for the place one afternoon and we figured we’d got the wrong address or wrong info. There was nothing in that alley that would indicate any kind of meat shop. It looked totally residential. So, he asked again at work and they told him the same address. He went back the next day and there it was. They just stick a little sign out front when they feel like opening, I guess! Anyway, he bought a good sized turkey breast. …..now, how to cook it. In a country as mind-bogglingly hot as Viet Nam, who wants/needs an oven in their house? It’s a rarity and only the more modern/wealthy homes have them. But Mike does have a little oven-y sort of grill in his place (emphasis on little). We thought maybe we could boil the turkey, then try to grill the outside…..maybe? It just didn’t sound like it would work out all that well. We thought probably a lot of the flavor would be boiled out and then the grill might just scorch the outside…..didn’t really sound good at all. BUT ~ Dee to the rescue! Mike’s mom suggested deep-frying it. There are all sorts of places here where they deep fry foods. They practically live on it! Now, how do we ask someone to do it for us? Well, it so happened that we’d invited a Vietnamese friend of ours over for Thanksgiving dinner. His name is Thanh and he is just a great young man. He speaks English quite well, having learned it on his own from youtube. I’ve mentioned him before ~ he’s the one who came to my rescue, restoring the internet to my computer after I’d klutzily removed it! Anyway, he could translate for us. So on Thanksgiving day, Mike and Thanh went out, breast in hand……uh, turkey breast ……getting a few stares, I’m sure…..and after a couple of attempts, found a place that would deep fry the turkey. They were told to come back in about an hour and a half and it would be done. So, they left the turkey there and came back to Mike’s place. We sat around talking and cooking and listening to Buena Vista Social Club on youtube, just having a really nice time. They then went back to pick up the turkey while I finalized some of the dishes. They walked in the door saying, “Wow, wait’ll you taste this ~ it’s great!” They were munching on the way home! 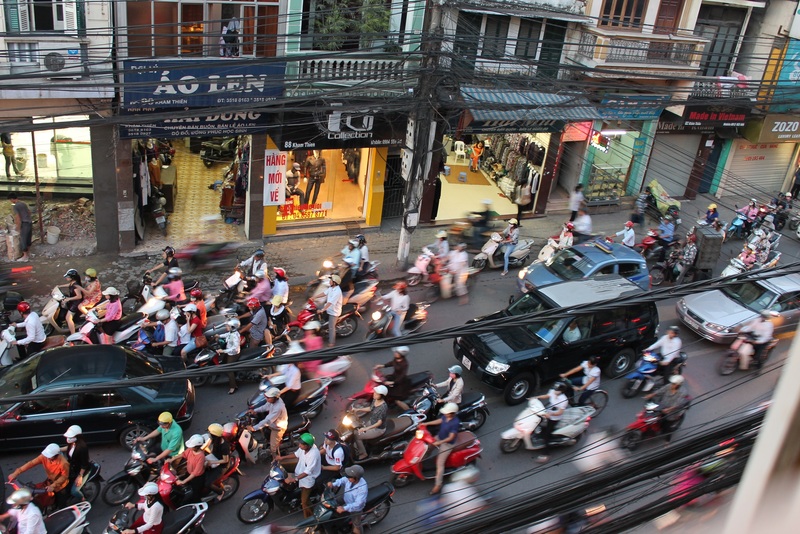 So, while the rest of Ha Noi were busy making their way home after work…. …..we took a few moments to follow our tradition of saying what we’re grateful for….. for our families and friends back home….to be here with friends in a foreign land…..our health….. the opportunity to fulfill a lifelong dream of travel…..
….then, just like millions of folk back home……we started eating! Here’s Mike’s coffee table covered with dinner. 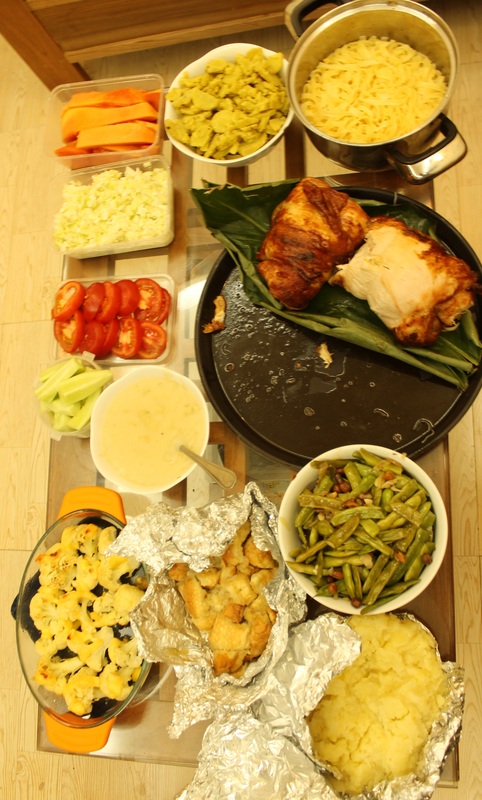 We had very limited cookware and dishes, so lots of stuff is in aluminum foil! The lighting makes everything a bit yellow, too. It was all quite delicious. 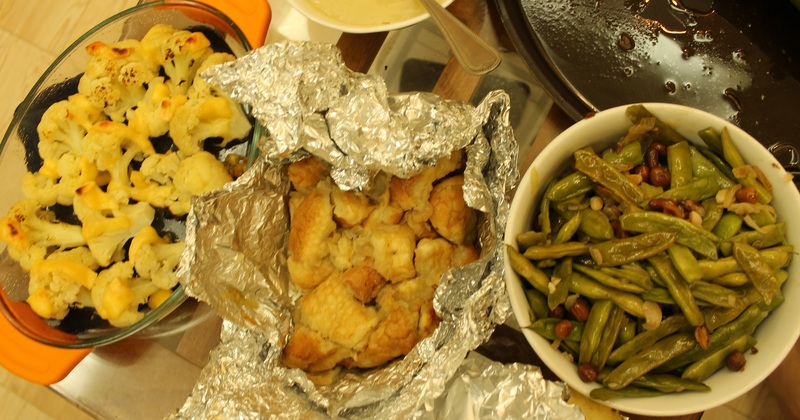 From left: cauliflower with cheese; stuffing; green beans with peanuts. We’d wanted green bean casserole, of course, but mushroom soup (at least mushroom soup as we know it) isn’t an easy thing to find, so we sautéed onions, shallots and roasted peanuts, then added steamed green beans. I don’t remember how the peanut idea came up, but I’m glad it did. It turned out really good. So, there’s the turkey, obviously, and we had some fruits and veggies and coleslaw (on the right) and some egg noodles and khoai lang, which is basically a sweet potato….oh, and mashed potatoes and gravy (made with duck stock from Mike’s favorite place for breakfast). The whole meal turned out very nicely. We were all stuffed, of course! It’s the first turkey I’ve eaten in….20? …maybe more? …years. Mike and Thanh were right ~ it was great! So, after dinner we sat around and talked some more. Mike fell asleep and Thanh and I talked for about an hour or two. I’d have to say my only regret about the evening is that I’d meant to take a picture of Mike and Thanh together and I forgot. ): Well, I know we’ll be seeing him again before we go back home, so I’ll get a picture of him. He’s a real sweetie. So, that was our Thanksgiving dinner. I hope you all had a wonderful day, too. Looks delicious! Glad you three were able to celebrate together! Looks and sounds great! We had a good one, too. Skyped with Drew in Tokyo and met his host mother. She doesn’t speak English, so we did a lot of waving and bowing.